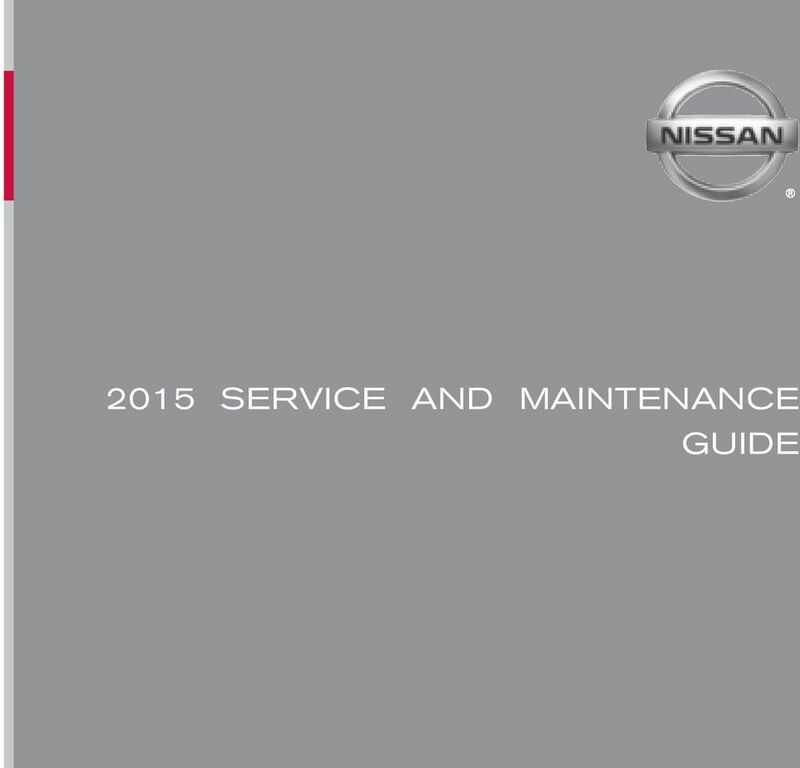 Download "2015 SERVICE AND MAINTENANCE GUIDE"
10 EXTENDED SERVICE PLANS* PREPAID MAINTENANCE PLANS Security+Plus Prepaid Maintenance Plans maintain your vehicle to factory specifications by factory-trained technicians. 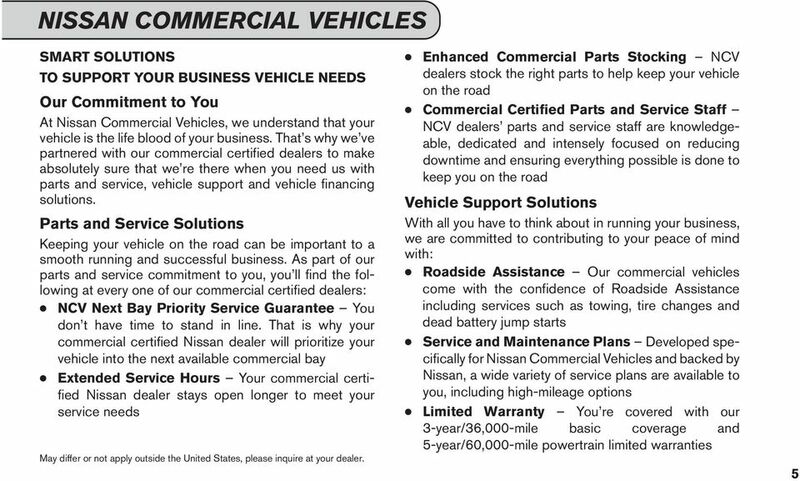 Like our Extended Protection Plans, you ll benefit from Nationwide Coverage and Nissan parts (includes Genuine Nissan, Nissan Value Advantage, or Nissan-approved new or remanufactured parts), and you ll be protected against the rising costs of parts and labor. 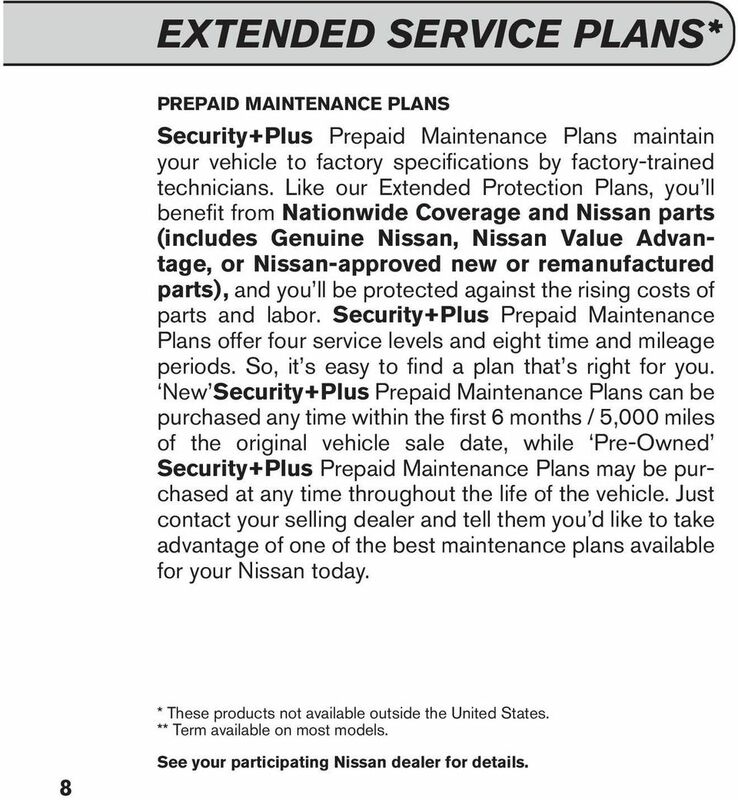 Security+Plus Prepaid Maintenance Plans offer four service levels and eight time and mileage periods. So, it s easy to find a plan that s right for you. 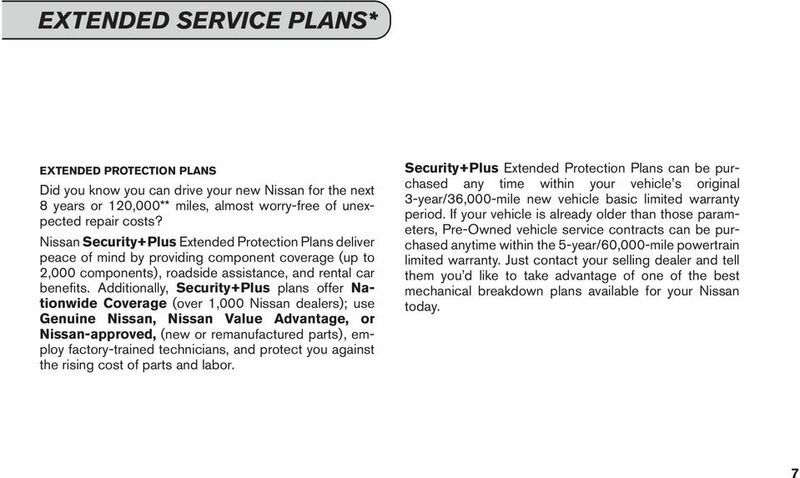 New Security+Plus Prepaid Maintenance Plans can be purchased any time within the first 6 months / 5,000 miles of the original vehicle sale date, while Pre-Owned Security+Plus Prepaid Maintenance Plans may be purchased at any time throughout the life of the vehicle. 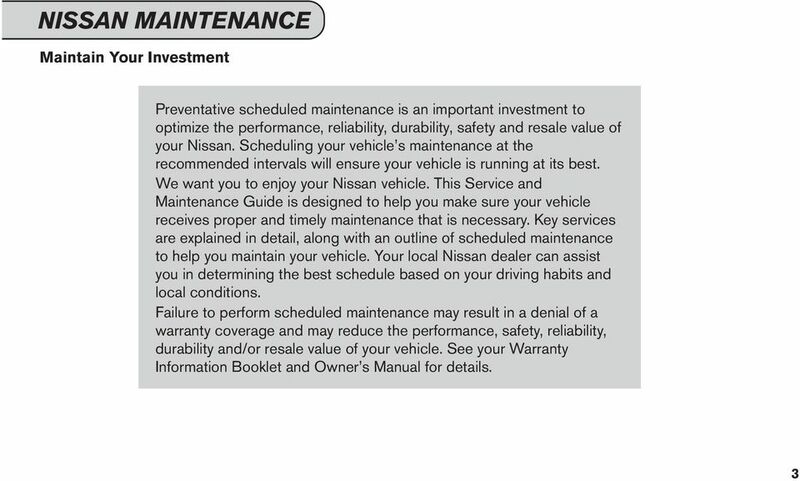 Just contact your selling dealer and tell them you d like to take advantage of one of the best maintenance plans available for your Nissan today. * These products not available outside the United States. ** Term available on most models. 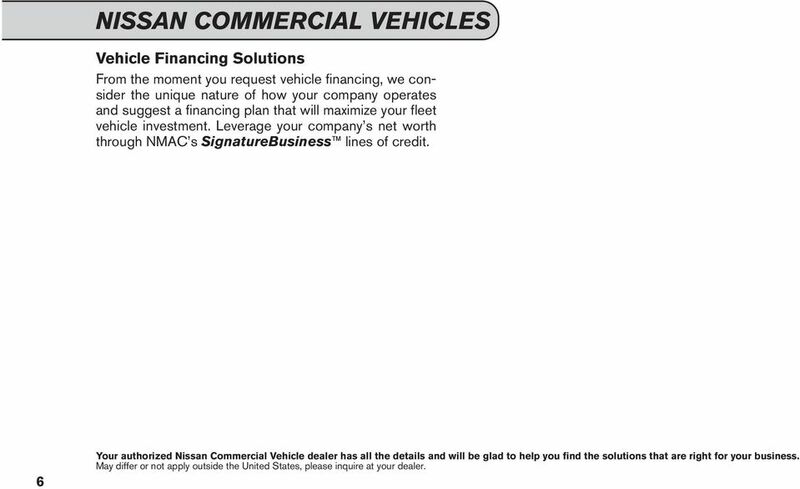 8 See your participating Nissan dealer for details. 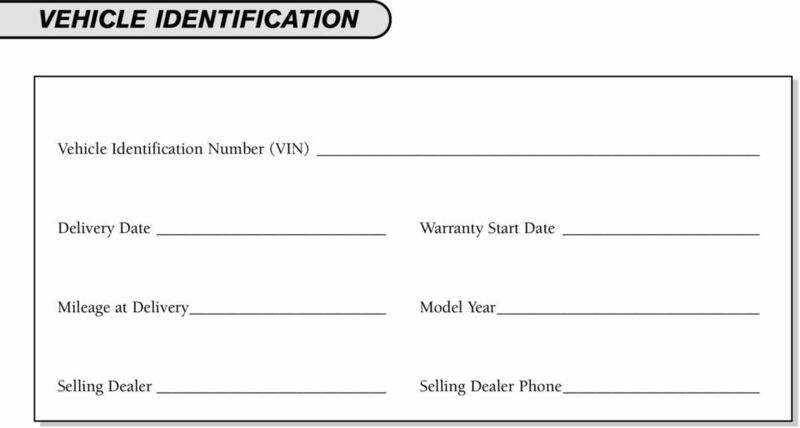 12 DETERMINING THE PROPER MAINTENANCE INTERVAL As a condition of your vehicle s warranty, you are responsible for properly maintaining your vehicle. 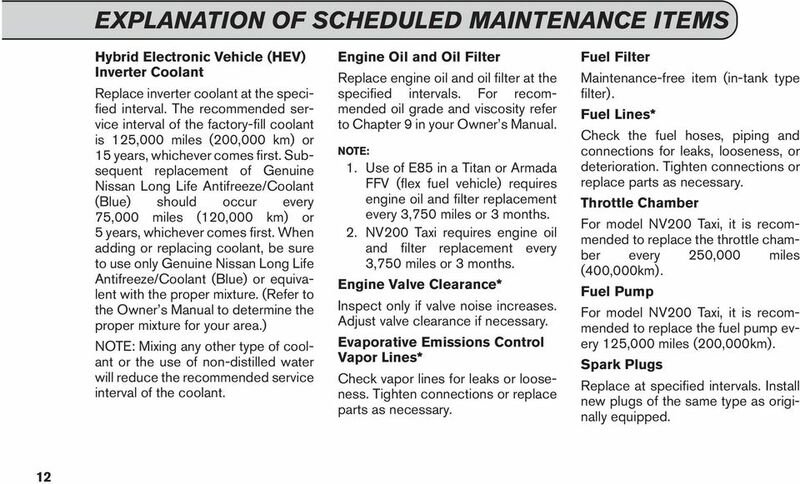 In maintaining your vehicle, you should use these guidelines to determine which maintenance schedule to use. Standard maintenance; features 5,000 mile or 6 month, whichever comes first, service intervals and generally applies when you primarily operate your vehicle on the highway in temperate conditions. 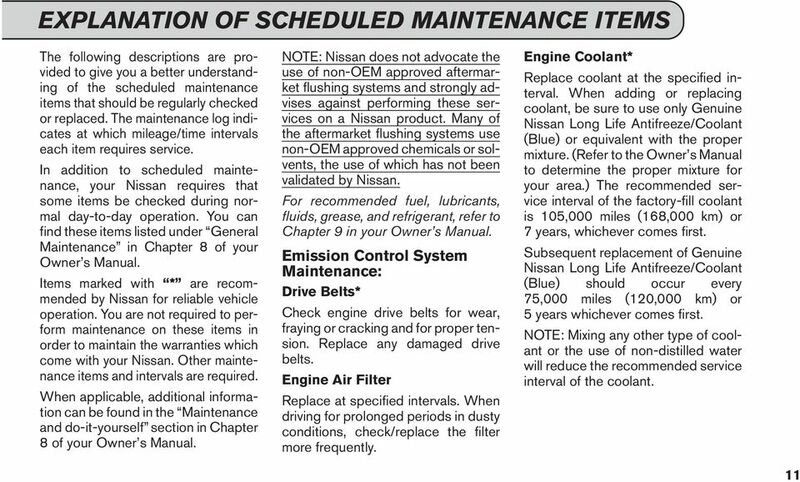 Premium maintenance is a Nissan recommended optional upgrade that adds services when maintenance is performed. Exceptions: 1. Use of E85 in a Titan or Armada FFV (flex fuel vehicle) requires engine oil and filter replacement every 3,750 miles or 3 months. 2. 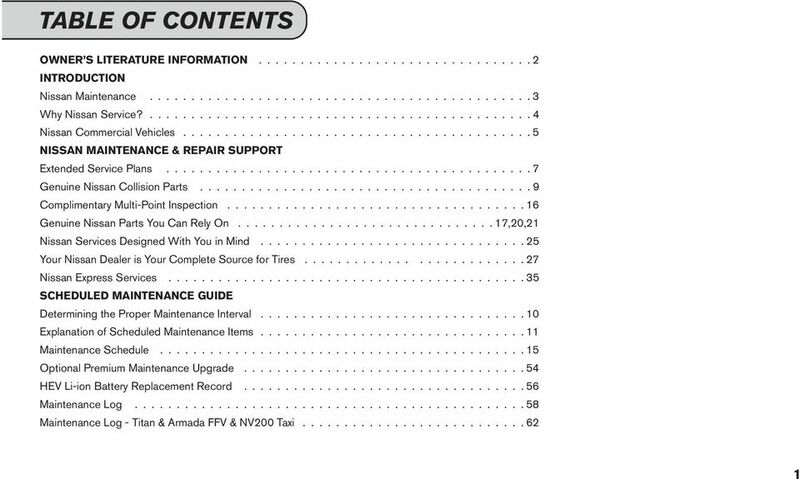 NV200 Taxi requires engine oil and filter replacement every 3,750 miles or 3 months. Premium Maintenance; * performing the Premium upgrade services may optimize the performance, durability, reliability, and resale value of your vehicle. 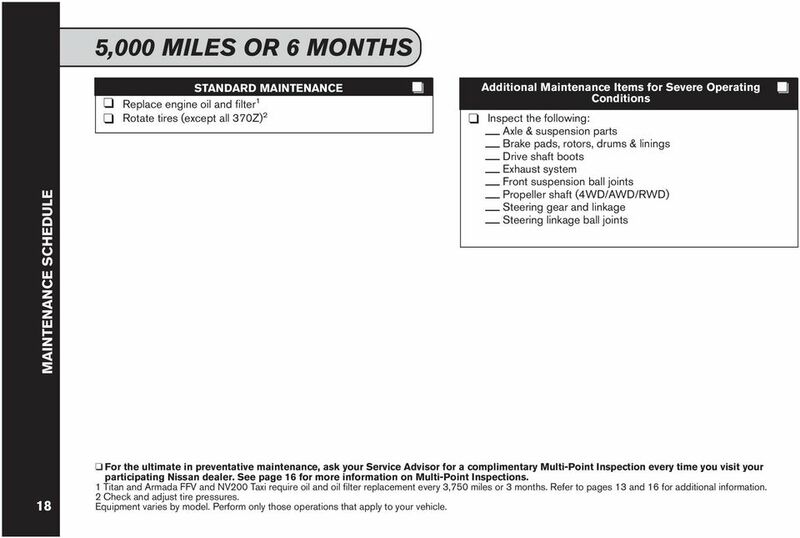 (Premium Maintenance items are available at every 30,000 miles or 36 months interval.) 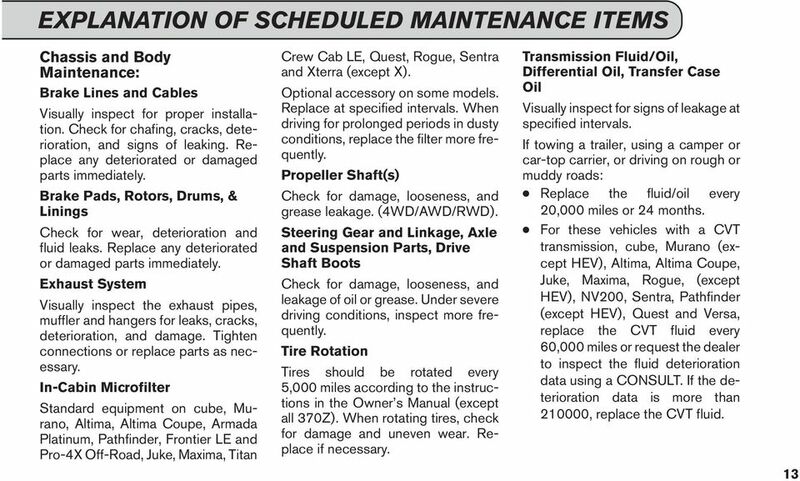 Additional maintenance items for severe operating conditions; should be performed on vehicles that are driven under especially demanding conditions. Additional maintenance items should be performed if you primarily operate your vehicle under the following conditions: Repeated short trips of less than 5 miles in normal temperatures or less than 10 miles in freezing temperatures. Stop-and-go traffic in hot weather or low speed driving for long distances Driving in dusty conditions or on rough, muddy, or salt-spread roads Towing a trailer, or using a camper or car-top carrier 10 For the ultimate in preventative maintenance, ask your Service Advisor for a complimentary Multi-Point Inspection every time you visit your participating Nissan dealer. See page 16 for more information on Multi-Point Inspections. 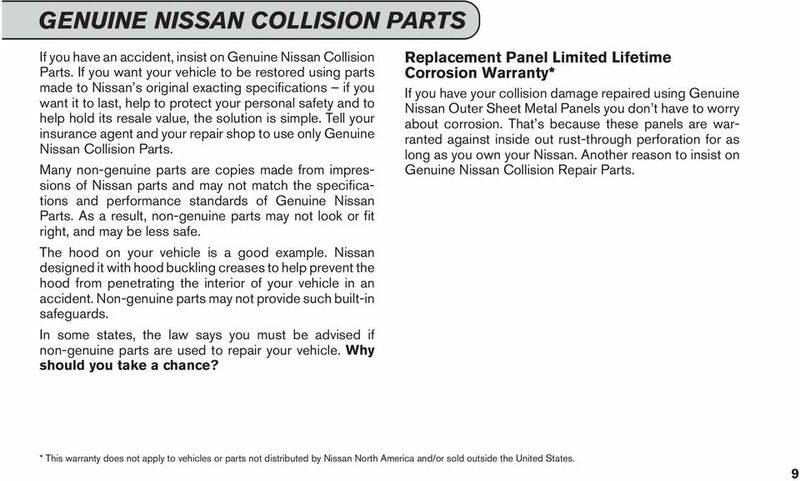 * Premium Maintenance is a Nissan-recommended option; You need not perform such maintenance in order to maintain the warranties which come with your Nissan. 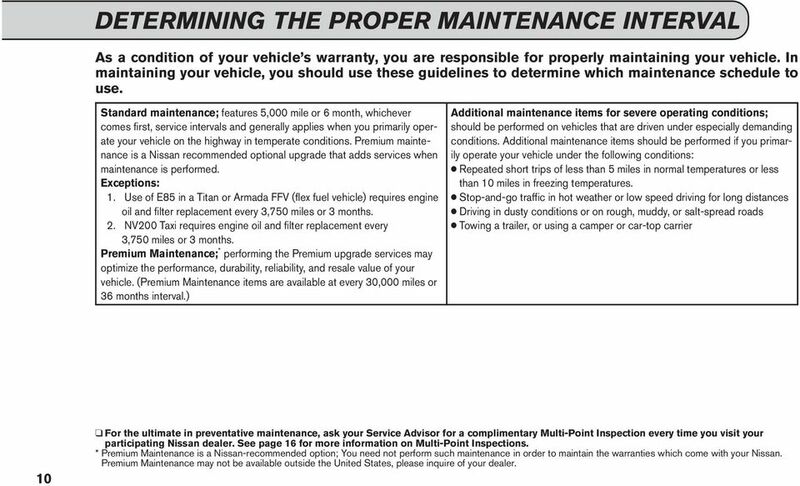 Premium Maintenance may not be available outside the United States, please inquire of your dealer. 20 MAINTENANCE SCHEDULE 5,000 MILES OR 6 MONTHS STANDARD MAINTENANCE Replace engine oil and filter 1 Rotate tires (except all 370Z) 2 Additional Maintenance Items for Severe Operating Conditions Axle & suspension parts Brake pads, rotors, drums & linings Drive shaft boots Exhaust system Front suspension ball joints Propeller shaft (4WD/AWD/RWD) Steering gear and linkage Steering linkage ball joints 18 For the ultimate in preventative maintenance, ask your Service Advisor for a complimentary Multi-Point Inspection every time you visit your participating Nissan dealer. See page 16 for more information on Multi-Point Inspections. 1 Titan and Armada FFV and NV200 Taxi require oil and oil filter replacement every 3,750 miles or 3 months. Refer to pages 13 and 16 for additional information. 2 Check and adjust tire pressures. Equipment varies by model. Perform only those operations that apply to your vehicle. 24 MAINTENANCE SCHEDULE 15,000 MILES OR 18 MONTHS STANDARD MAINTENANCE Replace engine oil and filter 1 Replace in-cabin microfilter 2 Rotate tires (except all 370Z) 3 Additional Maintenance Items for Severe Operating Conditions Axle & suspension parts Brake pads, rotors, drums & linings Drive shaft boots Exhaust system Front suspension ball joints Propeller shaft (4WD/AWD/RWD) Steering gear and linkage Steering linkage ball joints 22 For the ultimate in preventative maintenance, ask your Service Advisor for a complimentary Multi-Point Inspection every time you visit your participating Nissan dealer. See page 16 for more information on Multi-Point Inspections. 1 Titan and Armada FFV and NV200 Taxi require oil and oil filter replacement every 3,750 miles or 3 months. Refer to pages 13 and 16 for additional information. 2 Standard equipment on cube, Murano, Juke, Altima, Altima Coupe, Armada Platinum, Pathfinder, Frontier LE and Pro-4X Off-Road, Maxima, Titan Crew Cab LE, Quest, Rogue, Sentra and Xterra (except X). Optional accessory on all other models. 3 Check and adjust tire pressures. Equipment varies by model. Perform only those operations that apply to your vehicle. 26 MAINTENANCE SCHEDULE 25,000 MILES OR 30 MONTHS STANDARD MAINTENANCE Replace engine oil and filter 1 Rotate tires (except all 370Z) 2 Additional Maintenance Items for Severe Operating Conditions Axle & suspension parts Brake pads, rotors, drums & linings Drive shaft boots Exhaust system Front suspension ball joints Propeller shaft (4WD/AWD/RWD) Steering gear and linkage Steering linkage ball joints 24 For the ultimate in preventative maintenance, ask your Service Advisor for a complimentary Multi-Point Inspection every time you visit your participating Nissan dealer. See page 16 for more information on Multi-Point Inspections. 1 Titan and Armada FFV and NV200 Taxi require oil and oil filter replacement every 3,750 miles or 3 months. Refer to pages 13 and 16 for additional information. 2 Check and adjust tire pressures. Equipment varies by model. Perform only those operations that apply to your vehicle. 28 30,000 MILES OR 36 MONTHS MAINTENANCE SCHEDULE STANDARD MAINTENANCE Replace engine oil and filter 1 Replace engine air filter Replace CVT Fluid (NV200 Taxi) 2 Replace CVT Fluid (Hybrid Electronic Vehicle (HEV)) 8 Replace in-cabin microfilter 3 Rotate tires (except all 370Z) 4 Automatic transmission 5 Brake lines & cables Brake pads, rotors, drums & linings CVT fluid 6 Differential oil 7 Drive shaft boots Manual transmission oil Propeller shaft (4WD/AWD/RWD) Transfer case oil (4WD/AWD) Additional Maintenance Items for Severe Operating Conditions Replace brake fluid Axle & suspension parts Exhaust system Front suspension ball joints Steering gear and linkage Steering linkage ball joints 26 For Optional Premium Maintenance Upgrade information please see page 54. 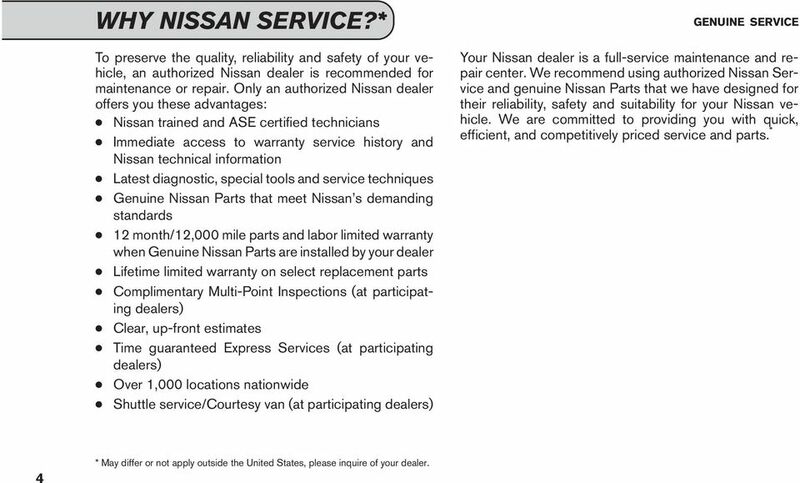 For the ultimate in preventative maintenance, ask your Service Advisor for a complimentary Multi-Point Inspection every time you visit your participating Nissan dealer. See page 16 for more information on Multi-Point Inspections. 1 Titan and Armada FFV and NV200 Taxi require oil and oil filter replacement every 3,750 miles or 3 months. Refer to pages 13 and 16 for additional information. 2 Please check fluid level before replacing fluid. If the level is abnormal, visit a Nissan dealership and have the cause of the abnormality repaired before replacing the fluid. 3 Standard equipment on cube, Murano, Altima, Altima Coupe, Juke, Armada Platinum, Pathfinder, Frontier LE and Pro-4X Off-Road, Maxima, Titan Crew Cab LE, Quest, Rogue, Sentra and Xterra (except X). Optional accessory on all other models. 4 Check and adjust tire pressures. 5 Automatic transmission fluid except for 370Z and NV 1500/2500/ CVT fluid on cube, Murano, Altima, Altima Coupe, Juke, Maxima, Rogue, NV200, NV200 Taxi, Pathfinder, Quest, Sentra and Versa. 7 Differential oil on 370Z, Armada, Frontier, Rogue AWD, Pathfinder AWD, Titan, Xterra, Murano AWD, NV 1500/2500/ Mileage only. Equipment varies by model. Perform only those operations that apply to your vehicle. 30 MAINTENANCE SCHEDULE 35,000 MILES OR 42 MONTHS STANDARD MAINTENANCE Replace engine oil and filter 1 Rotate tires (except all 370Z) 2 Additional Maintenance Items for Severe Operating Conditions Axle & suspension parts Brake pads, rotors, drums & linings Drive shaft boots Exhaust system Front suspension ball joints Propeller shaft (4WD/AWD/RWD) Steering gear and linkage Steering linkage ball joints 28 For the ultimate in preventative maintenance, ask your Service Advisor for a complimentary Multi-Point Inspection every time you visit your participating Nissan dealer. See page 16 for more information on Multi-Point Inspections. 1 Titan and Armada FFV and NV200 Taxi require oil and oil filter replacement every 3,750 miles or 3 months. Refer to pages 13 and 16 for additional information. 2 Check and adjust tire pressures. Equipment varies by model. Perform only those operations that apply to your vehicle. 32 MAINTENANCE SCHEDULE 45,000 MILES OR 54 MONTHS STANDARD MAINTENANCE Replace engine oil and filter 1 Replace in-cabin microfilter 2 Rotate tires (except all 370Z) 3 Additional Maintenance Items for Severe Operating Conditions Axle & suspension parts Brake pads, rotors, drums & linings Drive shaft boots Exhaust system Front suspension ball joints Propeller shaft (4WD/AWD/RWD) Steering gear and linkage Steering linkage ball joints 30 For the ultimate in preventative maintenance, ask your Service Advisor for a complimentary Multi-Point Inspection every time you visit your participating Nissan dealer. See page 16 for more information on Multi-Point Inspections. 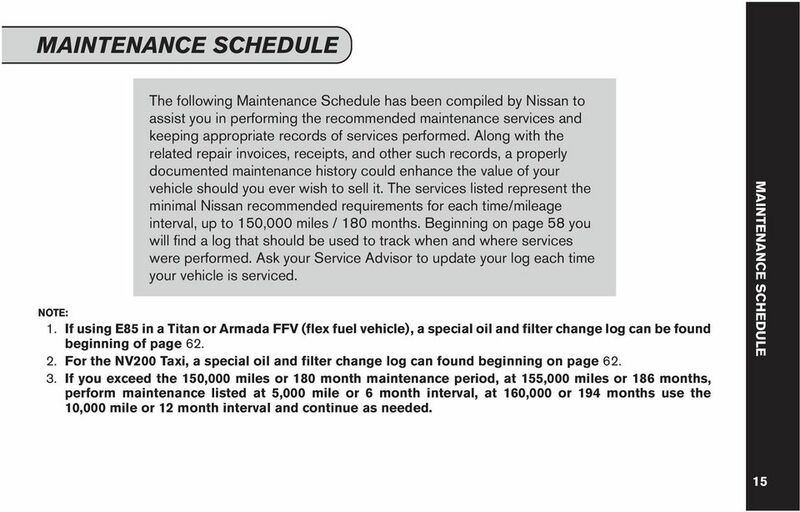 1 Titan and Armada FFV and NV200 Taxi require oil and oil filter replacement every 3,750 miles or 3 months. 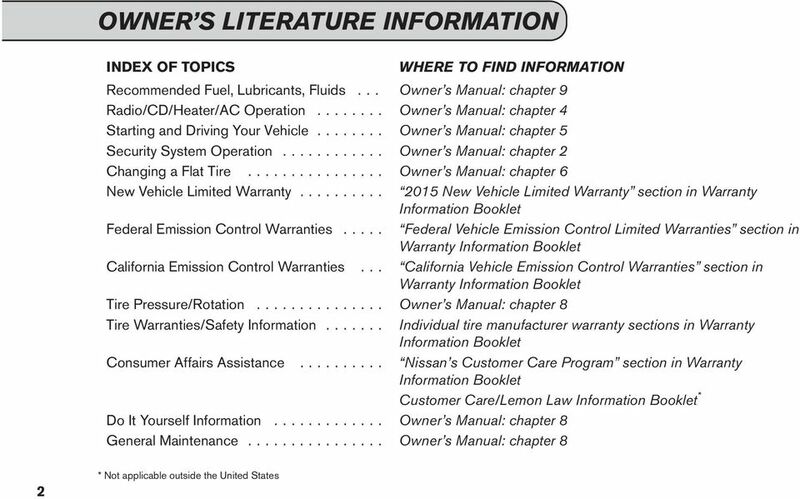 Refer to pages 13 and 16 for additional information. 2 Standard equipment on cube, Murano, Altima, Altima Coupe, Juke, Armada Platinum, Pathfinder, Frontier LE and Pro-4X Off-Road, Maxima, Titan Crew Cab LE, Quest, Rogue, Sentra and Xterra (except X). Optional accessory on all other models. 3 Check and adjust tire pressures. Equipment varies by model. Perform only those operations that apply to your vehicle. 34 MAINTENANCE SCHEDULE 55,000 MILES OR 66 MONTHS STANDARD MAINTENANCE Replace engine oil and filter 1 Rotate tires (except all 370Z) 2 Additional Maintenance Items for Severe Operating Conditions Axle & suspension parts Brake pads, rotors, drums & linings Drive shaft boots Exhaust system Front suspension ball joints Propeller shaft (4WD/AWD/RWD) Steering gear and linkage Steering linkage ball joints 32 For the ultimate in preventative maintenance, ask your Service Advisor for a complimentary Multi-Point Inspection every time you visit your participating Nissan dealer. See page 16 for more information on Multi-Point Inspections. 1 Titan and Armada FFV and NV200 Taxi require oil and oil filter replacement every 3,750 miles or 3 months. Refer to pages 13 and 16 for additional information. 2 Check and adjust tire pressures. Equipment varies by model. Perform only those operations that apply to your vehicle. 36 60,000 MILES OR 72 MONTHS MAINTENANCE SCHEDULE 34 STANDARD MAINTENANCE Replace engine oil and filter 1 Replace engine air filter Replace CVT Fluid (NV200 Taxi) 2 Replace CVT Fluid (Hybrid Electronic Vehicle (HEV)) 9 Replace spark plugs (NISMO 370Z) Replace brake fluid Replace in-cabin microfilter 3 Rotate tires (except all 370Z) 4 (Continued in next column) (Standard Maintenance continued from previous column) Automatic transmission Fuel lines/connections fluid 6,7 Fuel tank vapor vent system hoses Axle & suspension parts Brake lines & cables Manual transmission oil (if Brake pads, rotors, drums applicable) 7 & linings Propeller shaft (4WD/ CVT fluid 5,7 AWD/RWD) Differential oil 7,8 Steering gear and linkage Drive shaft boots Steering linkage ball joints Engine drive belts Transfer case oil Exhaust system (4WD/AWD) 7 Front suspension ball joints For Optional Premium Maintenance Upgrade information please see page 54. 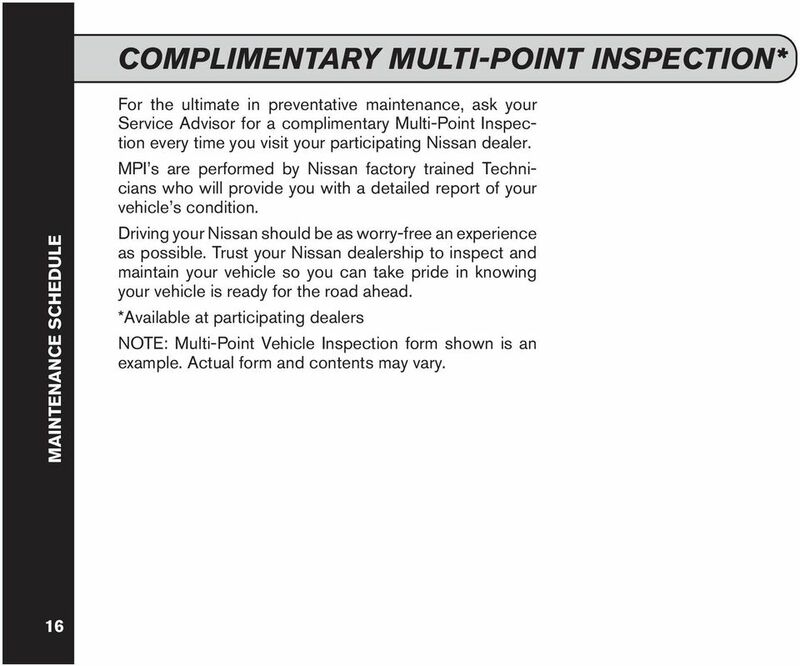 For the ultimate in preventative maintenance, ask your Service Advisor for a complimentary Multi-Point Inspection every time you visit your participating Nissan dealer. See page 16 for more information on Multi-Point Inspections. 1 Titan and Armada FFV and NV200 Taxi require oil and oil filter replacement every 3,750 miles or 3 months. Refer to pages 13 and 16 for additional information. 2 Please check fluid level before replacing fluid. 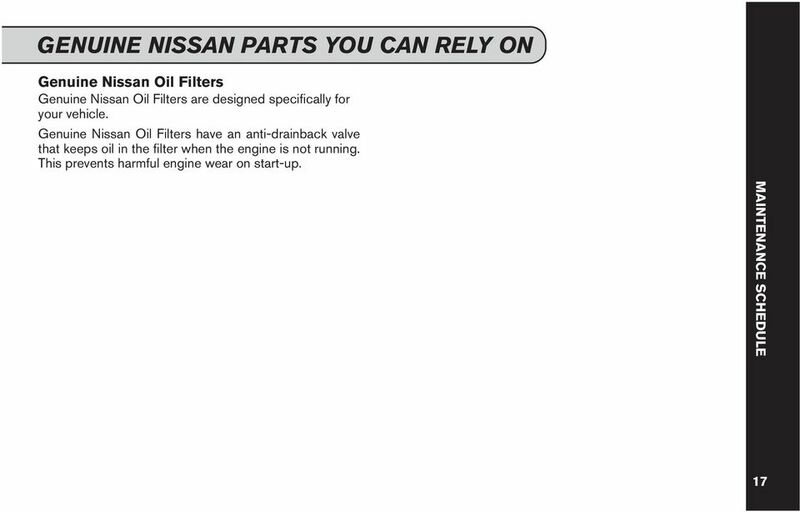 If the level is abnormal, visit a Nissan dealership and have the cause of the abnormality repaired before replacing the fluid. 3 Standard equipment on cube, Murano, Altima, Altima Coupe, Juke, Armada Platinum, Pathfinder, Frontier LE and Pro-4X Off-Road, Maxima, Titan Crew Cab LE, Quest, Rogue, Sentra and Xterra (except X). Optional accessory on all other models. 4 Check and adjust tire pressures. 5 CVT fluid on cube, Murano, Altima, Altima Coupe, Juke, Maxima, Rogue, NV200, NV200 Taxi, Pathfinder, Quest, Sentra and Versa. 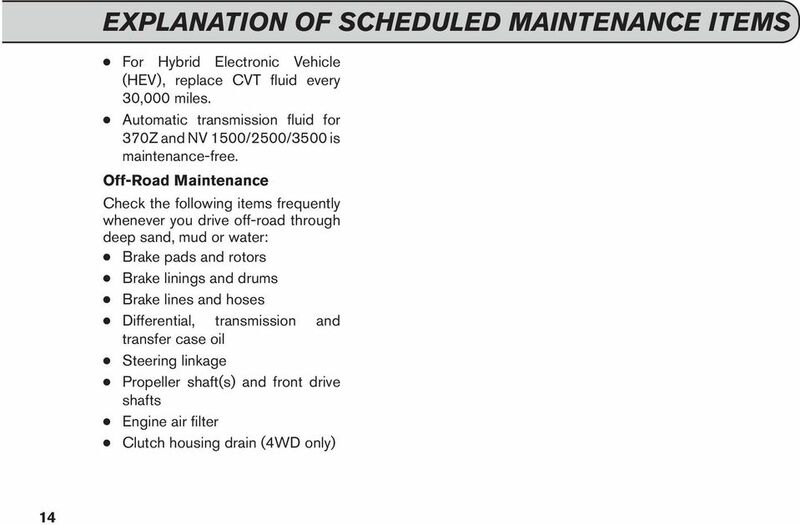 6 Automatic transmission fluid except for 370Z and NV 1500/2500/ Replace (not just inspect) oil/fluid if towing a trailer, using a camper or a car-top carrier, or driving on rough or muddy roads. (except Hybrid Electronic Vehicle (HEV)) 8 Differential oil on 370Z, Armada, Frontier, Rogue AWD, Pathfinder AWD, Titan, Xterra, Murano AWD, NV 1500/2500/ Mileage only. Equipment varies by model. Perform only those operations that apply to your vehicle. 38 MAINTENANCE SCHEDULE 65,000 MILES OR 78 MONTHS STANDARD MAINTENANCE Replace engine oil and filter 1 Rotate tires (except all 370Z) 2 Additional Maintenance Items for Severe Operating Conditions Axle & suspension parts Brake pads, rotors, drums & linings Drive shaft boots Exhaust system Front suspension ball joints Propeller shaft (4WD/AWD/RWD) Steering gear and linkage Steering linkage ball joints 36 For the ultimate in preventative maintenance, ask your Service Advisor for a complimentary Multi-Point Inspection every time you visit your participating Nissan dealer. See page 16 for more information on Multi-Point Inspections. 1 Titan and Armada FFV and NV200 Taxi require oil and oil filter replacement every 3,750 miles or 3 months. Refer to pages 13 and 16 for additional information. 2 Check and adjust tire pressures. Equipment varies by model. Perform only those operations that apply to your vehicle. 40 MAINTENANCE SCHEDULE 75,000 MILES OR 90 MONTHS STANDARD MAINTENANCE Replace engine oil and filter 1 Replace engine mounting bracket (NV200 Taxi only) Replace exhaust system (NV200 Taxi only) Replace in-cabin microfilter 2 Rotate tires (except all 370Z) 3 Additional Maintenance Items for Severe Operating Conditions Axle & suspension parts Brake pads, rotors, drums & linings Drive shaft boots Exhaust system Front suspension ball joints Propeller shaft (4WD/AWD/RWD) Steering gear and linkage Steering linkage ball joints 38 For the ultimate in preventative maintenance, ask your Service Advisor for a complimentary Multi-Point Inspection every time you visit your participating Nissan dealer. See page 16 for more information on Multi-Point Inspections. 1 Titan and Armada FFV and NV200 Taxi require oil and oil filter replacement every 3,750 miles or 3 months. Refer to pages 13 and 16 for additional information. 2 Standard equipment on cube, Murano, Altima, Altima Coupe, Juke, Armada Platinum, Pathfinder, Frontier LE and Pro-4X Off-Road, Maxima, Titan Crew Cab LE, Quest, Rogue, Sentra and Xterra (except X). Optional accessory on all other models. 3 Check and adjust tire pressures. Equipment varies by model. Perform only those operations that apply to your vehicle. 42 MAINTENANCE SCHEDULE 85,000 MILES OR 102 MONTHS STANDARD MAINTENANCE Replace engine oil and filter 1 Rotate tires (except all 370Z) 2 Additional Maintenance Items for Severe Operating Conditions Axle & suspension parts Brake pads, rotors, drums & linings Drive shaft boots Exhaust system Front suspension ball joints Propeller shaft (4WD/AWD/RWD) Steering gear and linkage Steering linkage ball joints 40 For the ultimate in preventative maintenance, ask your Service Advisor for a complimentary Multi-Point Inspection every time you visit your participating Nissan dealer. See page 16 for more information on Multi-Point Inspections. 1 Titan and Armada FFV and NV200 Taxi require oil and oil filter replacement every 3,750 miles or 3 months. Refer to pages 13 and 16 for additional information. 2 Check and adjust tire pressures. Equipment varies by model. Perform only those operations that apply to your vehicle.